Repotting seedlings is important in order to grow strong plants for your garden. In this post I will talk about the benefits, and tell you when to transplant seedlings into pots. 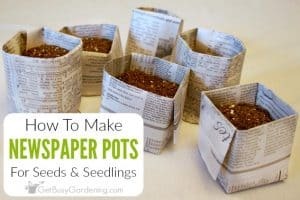 I’ll also show you the best types of containers and soil to use, and give you step-by-step instructions for how to pot up seedlings. Repotting seedlings is exciting because it means your plants are growing! Moving them into bigger pots means larger, healthier plants for your garden! Transplanting seedlings into pots isn’t a required step in successful seedling care. 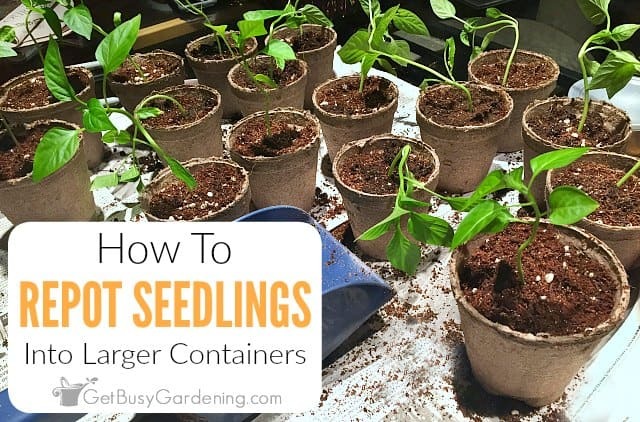 Many seedlings will grow just fine without being repotted. But they can start to suffer if they’re left pot-bound in those tiny seed cells for too long, which can stunt their growth. It’s important to learn the signs to look out for, so you’ll know exactly when to move seedling to bigger pots. 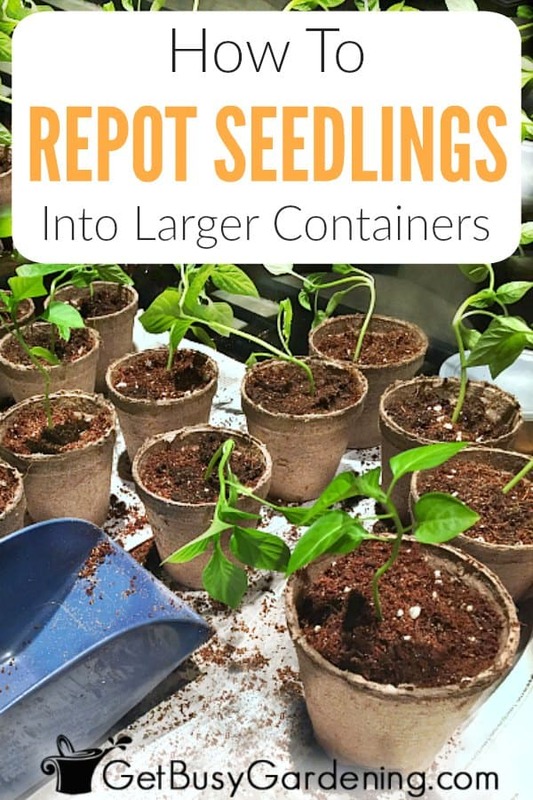 Here’s what you’ll find in the guide to repotting seedlings. You can click the links to skip ahead, or simply keep reading to learn everything you need to know! Do Seedlings Need To Be Repotted? Do Seedlings Really Need To Be Repotted? The short answer is No. Not all seedlings need to be repotted. Potting up seedlings is an optional step, and is not required for each and every plant. In fact, you should only pot up seedlings if they need it. Do not try to repot tiny or immature seedlings (e.g. : seedlings that don’t have a lot of growth, or haven’t grown their true leaves yet). Some seedlings will be just fine staying in the seed trays all the way up until the time you transplant them into the garden. But others will suffer if left pot-bound in those tiny seed cells for too long. The larger the seed, the more likely it is that you’ll need to pot them up. Seedlings that start as teeny tiny seeds may not require repotting. Large seedlings on the other hand will grow best if they’re transplanted into bigger containers as they mature. There are many benefits of potting up seedlings, and it’s a great way to ensure your seedlings grow strong and stay healthy. Potting up seedlings gives them more room to grow and mature. 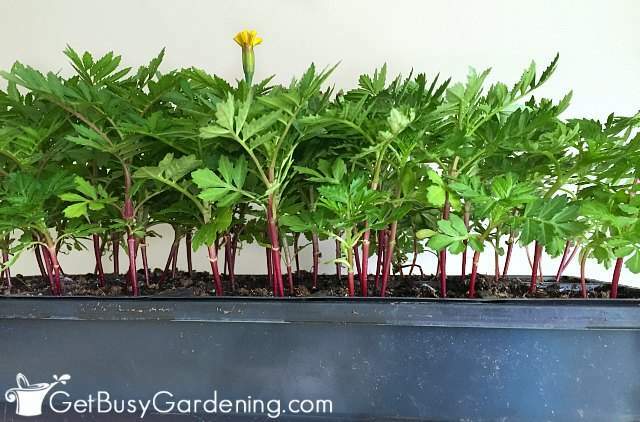 If seedlings are pot-bound in those small trays for too long, it can stunt their growth. 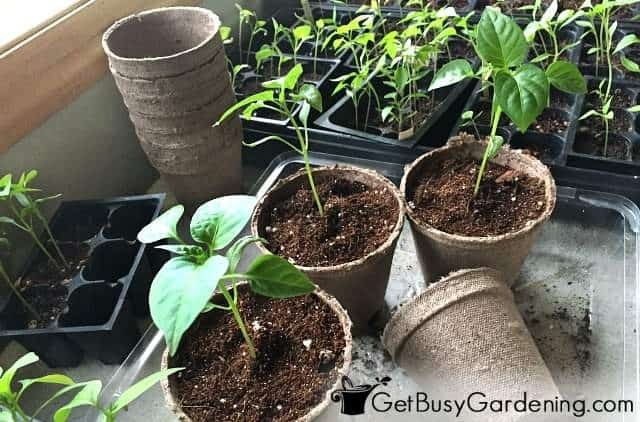 Transplanting seedlings into pots will also give them plenty of room to mature into small plants by the time they’re ready to be planted into the garden. This gives them a much better chance of success! Seedlings growing in their own pots will also help increase airflow, which lowers the risk of mold growth. Plus, they won’t be competing with each other for light and fertilizer once they’re out of the seed trays. So how do you know when to pot up seedlings then? There are several signs to look out for so that you know exactly when to move seedlings to bigger pot. When it comes to the type of soil to use for potting up seedlings, you have choices. 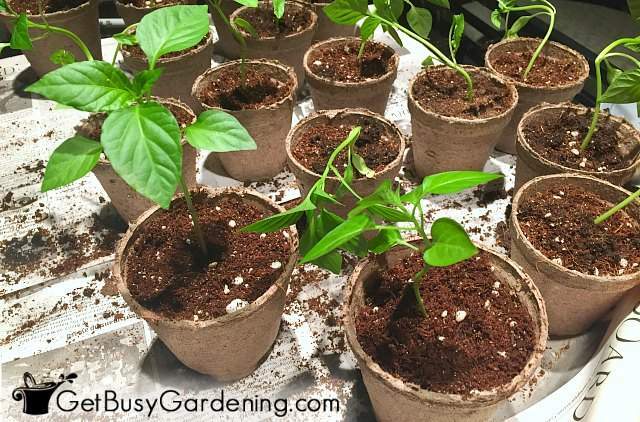 You don’t have to buy any special seedling potting soil, you can use whatever you have on hand. 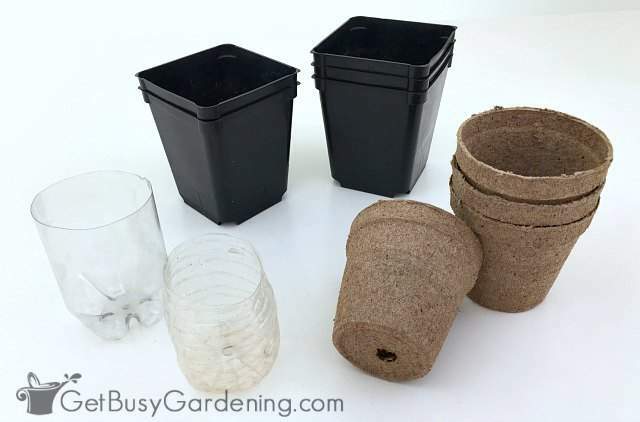 Leftover seed starting soil works great, or you can mix up a batch of your own if you have the supplies on hand. You could also use regular potting soil. Just make sure the soil you choose isn’t too heavy (and never use garden soil!). It’s best to repot seedlings using a lightweight soilless mix so their roots can grow easily. Also, don’t use any type of soil that has fertilizer in it, because it can harm sensitive seedlings. 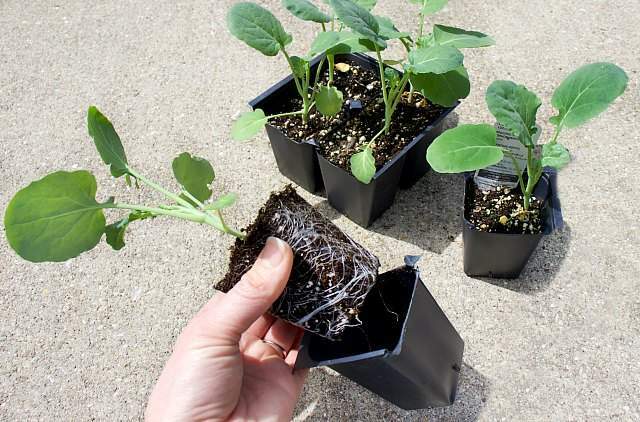 When it comes to choosing the best type of container to use for potting up seedlings, there are a few things to keep in mind. Choose a container that’s about twice the size of the seed cells (a 3-4″ pot size usually works great). And always be sure any plastic containers you choose to use have drainage holes in the bottom (or poke the holes yourself). Once you determine which of your seedlings need to be repotted, it’s time to get them ready for their big move. To make it easier on them (and on you), water your seedlings several hours before you pot them up. 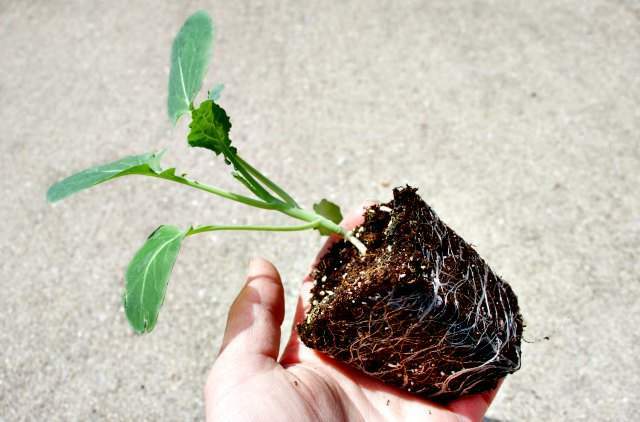 A moist rootball will hold together better than a dry one, making transplanting easier. Ensuring your seedlings are well hydrated will also minimizing the risk of transplant shock. Before you begin repotting seedlings, you might want to lay down a towel or a large bed sheet to catch any mess, and make cleanup easy. Step 1: Get your stuff together – It’s best to have everything ready to go before you get started. When I have a bunch of seedlings to transplant, I use an assembly line method. I fill each pot up with about an inch of potting soil, then line them up to get them ready. Step 2: Remove the seedlings from the seed cell – The key to this step is to be gentle and take it slow. Start by placing your fingers on either side of the stem, then flip the seed cell over. Squeeze the bottom of once cell until the seedling comes loose. Make sure you don’t pull or grab the seedling by the stem to remove it. If you are having trouble, you can use a spoon, butter knife, or skinny trowel to pop the seedlings out of the cell. Step 3: Straighten the seedling roots – If the seedling roots are growing in a circular pattern or are tightly root-bound, then gently tease them apart to straighten them. Take care not to break off any roots in the process. If there’s more than one seedling growing in a cell, then gently tease the roots apart to separate them. It’s important to plant each seedling into its own pot. They’ll be too crowded and won’t have enough space to grow if you don’t separate them. Step 4: Fill the pot with dirt – Place the seedling into the pot at the same depth as it was growing in the seed cell (i.e. : don’t bury the stem). As you work to fill the pot, lightly pack the soil around the seedlings rootball with your fingers. Step 5: Add a plant tag – Adding a plant tag to each pot will help you identify your seedlings later. 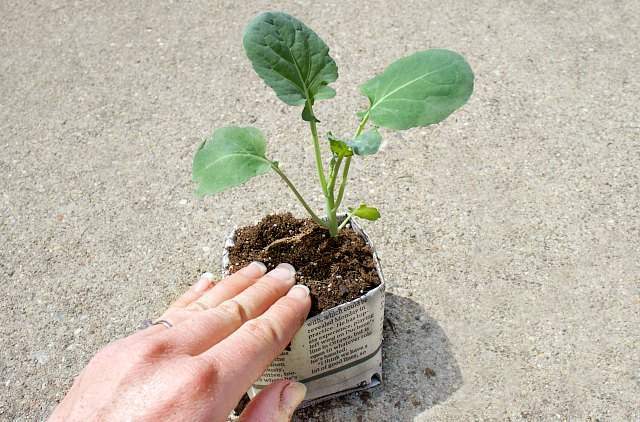 If you don’t have plant tags, you can write on the side of plantable pots with a marker or paint pen. Or put a piece of tape on your plastic containers, and write on that (I like to use painters tape because it’s easy to remove later). Step 6: Water the seedlings – Gently water each of your transplanted seedlings. It’s normal for the dirt to settle after you water them. If that happens, simply add a little more to top off them off. Once you have your seedlings potted up, there is a chance they will go into transplant shock. That means they may droop for a few days after being repotted. Don’t panic if this happens! It’s common and fixable. Just put them under the lights, keep the soil consistently moist, and hold off on fertilizing until they recover. They should pop back up and look healthy again in a few days. Repotting seedlings is a wonderful way to ensure that you grow strong, healthy seedlings for your garden. Once you learn the signs to watch for, you’ll know which seedlings need to be potted up, and exactly when to move seedlings into bigger pots. 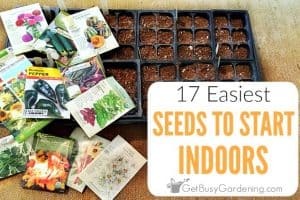 If you need a refresher or a quick start guide to planting your seeds indoors, then my Starting Seeds Indoors eBook is just what you need. Download your copy today! 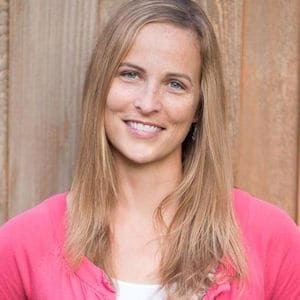 Otherwise, if you’re tired of struggling to learn how to grown seeds by trial and error, then you should take my Seed Starting Course! 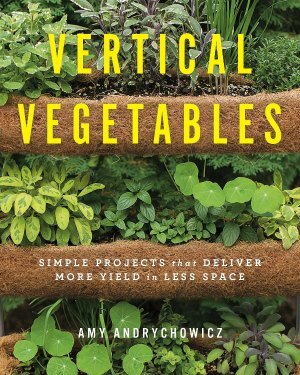 It’s a fun course that will teach you everything you need to know in order to grow amazing seedlings for your garden. Enroll in the course today! Share your tips for repotting seedlings in the comments section below! I have a question, you say if you have more than one seed in a cell, to separate them. Each plant gets its own pot. What if you used the peat pellets. How do you go about this? And another question regarding the pellets. How do you keep the seed’s roots from going into another pellet? I tend to mix trays with different things. 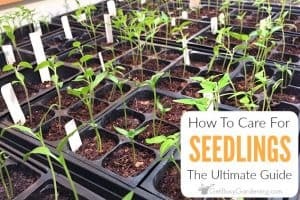 I recommend thinning the weakest seedling because trying to break apart the peat pellet may be too hard on the seedlings, and end up damaging them beyond repair. If the seedling roots are growing so long that they’re growing into neighboring pellets, then you should definitely pot them up. In fact, they should be potted up before it even gets to that point. Otherwise, you could try spacing the pellets a bit further apart in the trays to keep the roots separated.